In September of 1985, when I was seventeen, I moved in with my aunt and uncle in Boston. It was the first autumn since I’d been four years old in which my name wasn’t on any roll-call sheet. I wasn’t expected anywhere. I’d been kicked out of boarding school the previous spring and after getting my GED had spent the summer with my grandfather on Cape Cod, working as a gas station attendant. That fall in Boston I got through a lot of the hours playing solitaire Strat-O-Matic in my room. I don’t know what my aunt and uncle thought about the sounds of dice clattering deep into the night from behind my closed door. Sometimes in the daylight I left the house to supposedly go look for a job. In truth I mostly just wandered around. One day in particular that has always stayed with me for some reason was the day I smoked pot from my little metal one-hitter in Boston Commons, went to a matinee of Teen Wolf, then came home and lied to my aunt that I’d applied for several jobs all over the city. I’m not really sure why I lied, as my aunt and uncle never put any pressure on me to get a job. They may have started doing so eventually, but as it turned out I somehow did finally walk into an ice cream parlor in Harvard Square that had a “Now Hiring” sign. I worked part-time there for a couple months, then quit and went to stay with my father in New York City. My brother was going to NYU at that time, living in a dorm just a short walk away from my father’s apartment. I went over there most evenings and got high with him and his roommate, Eric, while the two of them took turns trying to blow the other’s mind with selections from their ridiculously large and ever-growing collection of Jamaican dub music. As the current song was coming to an end, my brother or Eric (depending on whose turn it was) rose in the dim blue light of the room and selected another song, shielding the album from the other so that the song would be a surprise. Not much in the way of conversation occurred, but occasionally my brother or Eric uttered a complementary, drawling, long-voweled “dude” when the other’s song choice was exceptionally pleasing to the dude-utterer’s bass-hungry senses. After many bong hits and offerings from the likes of Augustus Pablo, Scientist, and King Fatty, I stumbled back to my dad’s place, where he would already be asleep, all the lights off. The studio apartment had only one separate room, the bathroom, and since I often came home too high to sleep I spent many a night sitting on the shut lid of the toilet, reading On the Road. I wanted my life to be like the one in the pages of that book, exciting, adventurous, everything hallowed. The holidays came and went, and in January I applied to a small state college situated on top of a mountain in northern Vermont. It wasn’t a hard school to get into, so I got in, and within a few days was there for the start of the spring semester, which began the day the Patriots got annihilated by the Bears in the Super Bowl. I got stoned and drunk that day with a couple fellow new students, and as it turns out one of them was named Fritz. Fritz was gone by the following semester, as were some of my other new partying buddies, and the rest of them were gone within the next couple semesters. It was a college where people who had fucked up elsewhere came and hung out for a little while before moving on. I stayed, however. Eventually my drug usage tapered off. The last time I tripped on acid was on Halloween 1987, at a Phish show at Goddard College. It was a bad trip, narrow, jittery, alienating, laced with the smell of my own burning synapses, and I spent most of it crashing around alone through limb-scraping brush in the dark woods behind the art building where everyone was having a fantastic time dancing and laughing together, everyone singing about Halley’s Comet and the land of lizards, everyone wrapped in colorful costumes, the guitarist and bass player hopping up and down in jester hats, the drummer in a matronly dress. All I had on was my Josh Wilker suit–ripped jeans, T-shirt, army jacket, Converse all-stars, skin–and if I could have I probably would have taken it all off and set it on fire. What I’m trying to get at here is that I’m haunted by boundless possibilities, and I always have been. My earliest years, the early 1970s, came in a time and place bubbling with the idea that anything was possible. The ecstatic visions of Jack Kerouac seemed less an elegiac psalm to an evaporating world than a prelude to a world yet to come. You could be whoever you wanted to be and each day was going to be a new transformation, the promising light of the present moment giving way to even brighter, warmer, wider light. In the early 1970s, the number of my parents went from the traditional two to three, my mom’s new boyfriend Tom coming aboard. It may sound strange, I realize, but this was far from the only commune-like free love experimentation of the time. At least for some, that kind of thing was just sort of in the air. 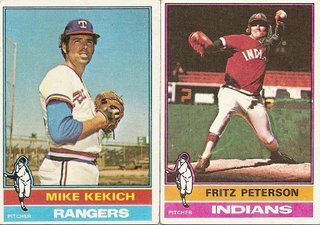 For example, right around the same time, just before the start of the 1973 baseball season, Mike Kekich and Fritz Peterson traded entire families. Much has been written about this swap, most of it in a mocking tone, so I’m not going to say much beyond pointing out that when they did it they meant it. Maybe it was in large part an extension of the fun they were all having together, but they must have believed they weren’t merely pulling a pleasurable stunt. Beyond the pleasure of the moment, there must have been a hope for some as yet uninvented republic of joy. I don’t even really want to talk about how they both had career-worst years that season, or that in general they never really were the same as players again, or that Kekich decided after a few weeks that the experiment wasn’t working out, a decision that came too late–his wife and Fritz Peterson already having decided they wanted to make the swap permanent. I really just want to shine a light on that slim brilliant moment in time when the world seemed to some to be clay in their hands, moldable to any shape they desired. I chased that moment for a long time. I wanted the sky to crack open and spill all its secrets. I never did see any such thing. I saw Teen Wolf. I saw William “The Refrigerator” Perry score a touchdown. And one day while tripping on low-grade LSD I watched some mountains turn into a pair of old basketball sneakers. You are currently browsing the archives for the Fritz Peterson category.